It is fifty years since the Irish Defence Force went to serve as part of a United Nations Peacekeeping Mission in the Congo in July 1960. The experiences and events of their service there reflect both the inconsistencies and constraints of the original UN mandates and the complex political and military situation extant at that time, but also the determination of the Irish to carry out the work of the UN and keep the peace, and indeed create peace, in the Congo. Based on the experiences of many of the soldiers who served there, this article gives a quick overview of the four years and primarily concentrates on the initial phase of operations in the Congo and explains some of the routine work involved in peacekeeping. It deals with an overview of the history of the Congo, the background to the formation of UN Forces, organisation of initial units and preparations for departure, uniforms and health in the early stages, the nature of the deployment areas, negotiating skills and tension reduction tactics, patrols and the lead-up to Niemba, new equipment, operations 1961 to 1963, humanitarian projects and provides a conclusion. The Military Heritage of Ireland Trust CLG is pleased to announce the opening of the new Glasnevin Museum at Glasnevin Cemetery, which was opened by An Taoiseach, Mr. Brien Cowen T.D on 8th April 2010. The self-funded €11 million museum will showcase the social, historical, political and artistic development of modern Ireland, through the lives of 1.5 million people buried in Ireland’s national acropolis. 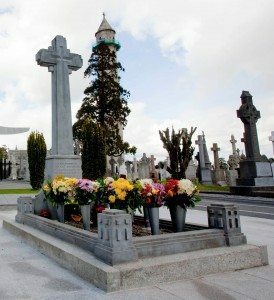 Glasnevin Trust, which operates the cemetery, expects the Museum to cater for 100,000 visitors from home and abroad in the period May to December 2010. This will rise to 200,000 in 2011. The cemetery was originally opened by the great ‘Liberator’, Daniel O’Connell, in 1832 for the purpose of ‘burying people of all religions and none’ with dignity. Since opening 178 years ago over 1.5 million people, from all walks of life, have been buried in Glasnevin. Each and every detailed burial record is preserved both in the cemetery’s original handwritten journals and also hosted online on Glasnevin Trust’s web-site www.glasnevintrust.ie . €4.00 for children, with 10% discounts offered for students and OAPs. Glasnevin walking tours run daily at 11.30 am, 12.30 pm and 2.30 pm. Family tickets for both the museum and cemetery walking tour can be purchased for €25.00 (2 adults and 2 children). It is intended that a ‘Military Heritage Trail’ will be created for the cemetery. 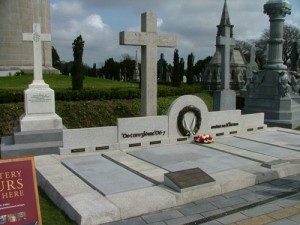 There are many famous persons associated with the Irish War of Independence, and other military events, whose graves are to be found in the cemetery. These include Kevin Barry, Cathal Brugha, Michael Collins, Eamon De Valera, Anne Devlin, James Devlin (Balaclava 1854), Arthur Griffith, Kitty Kiernan; Maud Gonne MacBride, Countess Markievic, James Murray V.C. (South Africa 1881); Frank Ryan. Others include a Royal Dublin Fusilier and an Irish Volunteer who were killed in Dublin during the 1916 Rising – they lie close to one another. 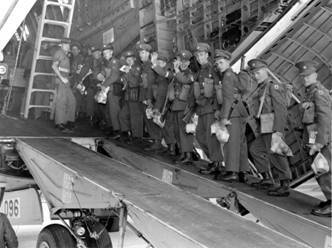 The Military Heritage of Ireland Trust are pleased to announce the addition of the following military heritage website to the ‘Links’ section of its website. http://www.themanwhocapturedwashington.com/ .